The goal of this work was to tackle the problem of characterising clay rock by means of Proton (1H) Nuclear Magnetic Resonance Techniques at low magnetic field. Clay rocks chosen for the study were Callovo-Oxfordian clay (France) and Boom clay (Belgium) which both constitute geologic layers of the deep underground dedicated to storage of nuclear waste, and also bentonite which is used to build protective layers at the contact of waste containers. When the project started, bibliography showed that almost no NMR work existed in this field. We put all our efforts on studying raw materials directly extracted on site and –as far as possible- kept in their natural state during transfer to the laboratory. This point justified the close collaboration between PMP (NMR) and Geotechnique (sample knowledge and handling) teams of laboratoire Navier. Fig. 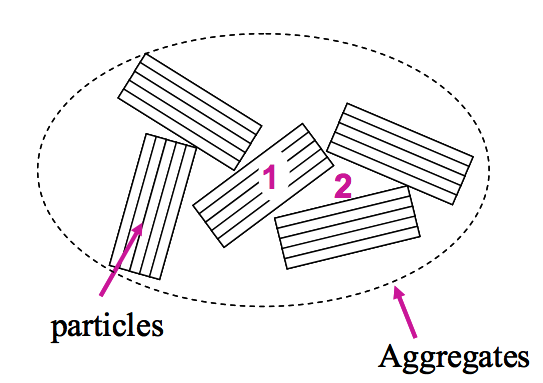 1: porosity levels in a clay paste (schematic). 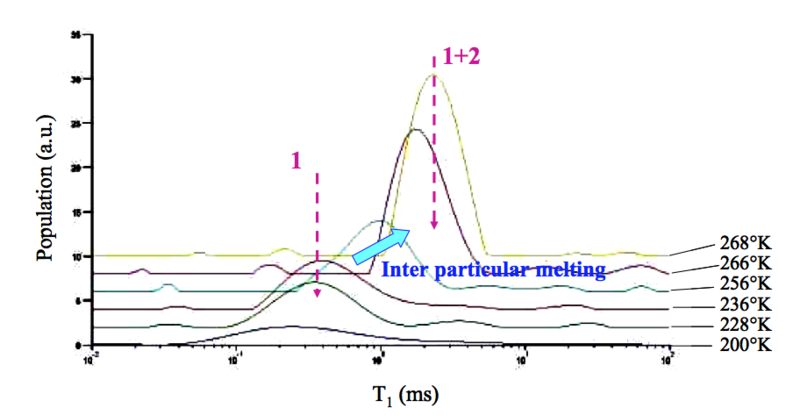 As far as pore space characterization by means of interstitial water NMR is concerned, it was shown that whatever the rock under study, T1 and T2 relaxation spectra at room temperature are not able to distinguish between various pore sizes (in particular intra and inter particular pores) due to fast diffusion of water molecules between the two kinds of porosity, and are limited to characterizing average specific surface at the scale of the elementary representative volume. 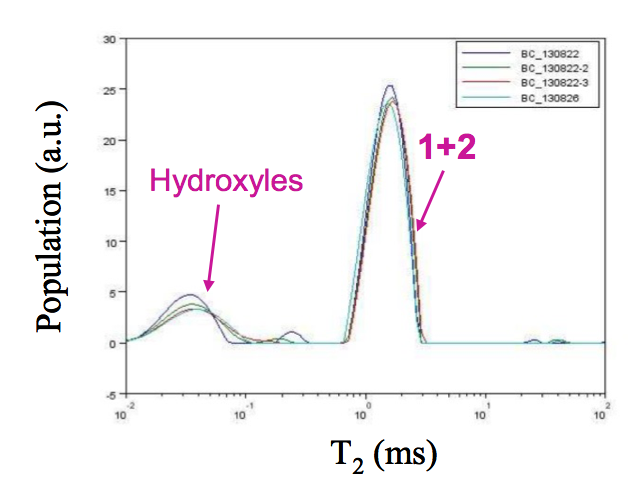 T2 relaxation spectra also showed an additional relaxation component, which can not be attributed to interstitial water and could correspond to hydroxyl groups at the surface of clay platelets, thus providing a means for quantifying them. This hydroxyl component was also observed on T1 spectra as a very wide feature looking as a slight base line offset but of impractical use for analysis though. Interpretations and correlation between T1 and T2 features were confirmed by 2D spectra. In the special case of clays, 2D spectra were also found not to bring any further information than 1D spectra, and were then regarded of little interest for everyday studies. Fig. 2: T2 relaxation spectrum of Boom clay at room temperature. Numbers indicate involved porosity levels. The combination of cryoporometry and the recording of relaxation spectra as a function of melting temperature was found far more informative about porosity. T1 and T2 spectra indeed exhibit a clear evolution when inter particular water melts, allowing quantifying pore size and overall volume of this porosity level in the sample. Fig. 3: T1 relaxation spectrum versus melting temperature in water saturated Boom clay. At the end of the project, we came aware of a parallel work at IFPEN on similar samples, but at purified state and manipulated as powders. Results were very similar to our work on raw samples, which seems to us an important result as such. Perspectives to this work are the use of relaxation phenomena as contrast source on Magnetic Resonance Imaging (MRI) pictures to observe water transport at centimetre scale. This will allow studying at the laboratory the important of problem of drying of clay rocks at surface of storage galleries.